Your out-of-office reply is often the last thing on your mind and the last thing you do (if you do it at all), when you go on vacation or attend a conference. That’s unfortunate since your out-of-office message is an important part of customer service and client management while you’re away. Other people are relying on you. A simple, clear out-of-office reply demonstrates client management and co-worker respect. Keeping clients informed is also great customer service, time management and business etiquette. And. your out-of-office message is going to help you relax while you’re away because it’s less likely something will go ‘critical’ because you are out-of-office. The bonus is that if your respect your clients and co-workers you’ll also protect your brand and reputation. Here are three steps you can take. Why wait to the last-minute? Make your pending departure part of your email signature and voice mail ahead of time. All of your clients and co-workers are busy; this also serves as a gentle reminder. Write your best out-of-office reply ahead of time. Follow the voice and email guideline I’ve provided below. Identify your back-up person and prepare them for your departure. Follow the work with your back-up guideline I’ve provided below. Update your ‘at work’ calendar so it shows you are out-of-office. One approach I often use when I’m going to be away for a week or more is to block my calendar as out-of-office one day earlier – and in the office one day later. This helps me prepare and manage critical / last-minute things at the back-end and sort through email and phone messages and get caught-up on the front end in a controlled – focused way. Risks of a bad out-of-office reply (or no message at all), is that your mind and energy will keep focusing on work-related ‘stuff’. This isn’t fair to you or the people you are with. Especially on vacation, everyone needs to get some time-off. What should you include when creating an expert out-of-office reply? The following provides some business etiquette guidelines – but also consider your audiences specific needs. Will you be checking messages? Will someone else pick-up and respond to your messages? Give the people calling all the information they need to act or to find your back-up. Don’t make them hunt for an email or phone number – they have already spent time trying to call you. Hunting down your back-up will only frustrate them… and your back-up is going to be the one getting an earful. 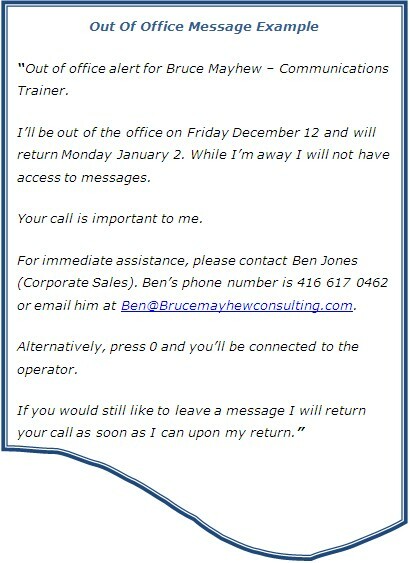 I’ll be out of the office on Friday December 12 and will return Monday January 2. While I’m away I will have limited access to my email. I’ll be checking email (once a week, every morning, etc). If you have a back-up (like Ben), make sure Ben knows he is your back-up and also that Ben will be in the office (and not on his vacation). Then, spend time with your backup to review your accounts / projects. Set them up for success – not failure. Review critical clients and expectations with them. 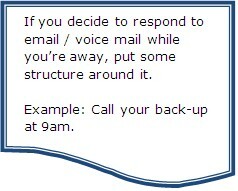 This will help prevent emergency phone calls and email to your while you’re away. Make sure your backup is managing tasks – not putting out fires. Oh – and when you are away I recommend you turn roaming off your smartphone. Often your App’s (Blackberry, iPhone, Android or other), will keep ‘pinging’ the service server and updating. Turning your phone off will save you from a large bill. If you’re looking for how to set up an out-of-office vacation auto-reply check with your email or voice mail service provider. Each program has variations both within the program application as well as each version. If you’re planning to be reachable while you are out-of-office so that you stay up-to-date, be sure to set parameters around your contact. I personally try to avoid staying in touch when on vacation – everyone needs a rest. Thanks for this post, Bruce. Your instructions are thorough and — with holidays coming up — timely. In my voicemail greeting, I only specify the return date. In your example, a caller on Dec 30 doesn’t need to know that I’ve been away since the 12th. Instead of saying I’m out of the office, I’ll say “I’m traveling” or “I’m out meeting clients”. That’s a tip from an excellent book, How To Be A Rainmaker by Jeffery Fox. Thank you for your comments and additional perspective Promod. They all make sense. The beauty of this is that it needs to be relevant to you… and the person emailing / calling you. Therefore, the language you use and the information you include can vary. If they don’t need to know when you’ve left – it makes sense not to include that. If there is an ongoing project and they may wonder why things have slowed down for the last week (example), then I would include the date you left so that they know you are not falling behind or ignoring them. In the end, if my reputation is on-the-line I play safe.